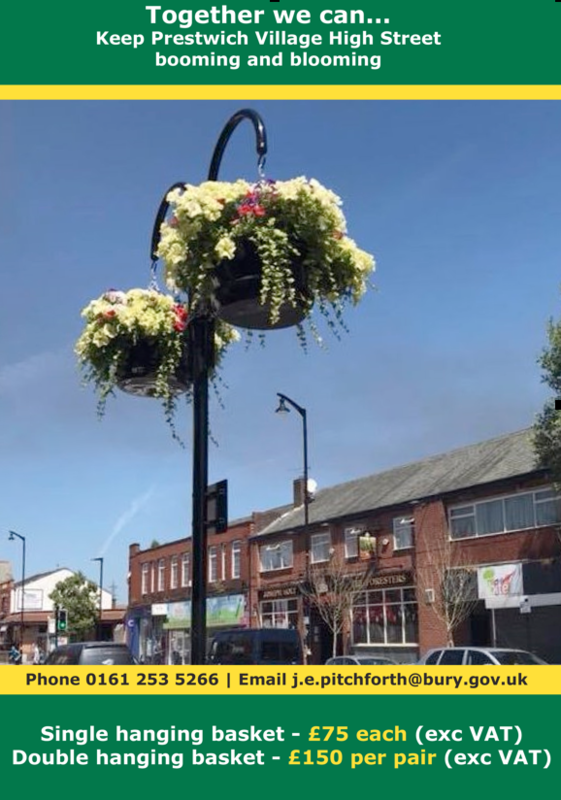 Bury Council is looking for local businesses to sponsor hanging baskets in Prestwich village to bring a splash of colour and play a big part in brightening up the town. Last year the hanging baskets along Prestwich Village high street were funded by the Prestwich High Street Regeneration Scheme. This year the Council want to work in partnership with local businesses so that together we can sustain a summer floral display and keep Prestwich a vibrant and attractive place for both residents and visitors alike. remove the baskets at the end of the summer. Sponsorship costs for the hanging baskets are as follows. To secure your sponsored hanging basket(s), please contact me on 0161 253 5266 or email j.e.pitchforth@bury.gov.uk. Please be aware that baskets will be allocated on a first come first served basis.